Most of the World's population is health illiterate. Most people do not understand the medical treatments they are offered. The World needs a physician spokesperson who can speak science to the masses. Healthcare used to be "paternalistic," because doctors told patients what to do. There was no Internet and little information was available for patients. Paternalism resulted in bad things, such as the epidemic of unnecessary hysterectomies. Today, healthcare is "paternalistic/maternalistic," because 3rd parties are telling doctors what to do, and then doctors tell patients what to do. It's paternalism once removed. Why can't doctors and patients figure out treatments together? Why can't we have true shared decision-making? Why are things so rotten? Because there is so much disorganized information. Physicians are not practicing evidence-based medicine, they are practicing Eminence-based medicine or Authority-based medicine. This is resulting in bad things happening to patients because of biases: over-treatment, under-treatment, mistreatment and even harmful treatment. Patients, doctors, and nurses are going to have fix this from the bottom up. Future physicians are going to have to give patients the information that is relevant to them, in a way that they can understand it. What if your mother is diagnosed with ovarian cancer? What if your father gets prostate cancer? What if your child gets Hepatitis C? What if you suffer from insomnia? You will need is a list of treatments and Treatment Scores for your diagnosis. Treatment Scores take evidence-based medicine to the next level. But first, please read the rest of this essay. The Treatment Score = the net treatment benefit for the patient. There are often 5 or 10 treatments for a disease. Breast cancer has 30 treatments. There are 130 treatments for insomnia! Sometimes a patient will be cured by treatment that was never on their doctor's list of treatments. We must organize treatment lists and quantify Treatment Scores. The patient assumes the physician knows all the statistics. You might assume your own physician practices evidence-based medicine. If you assume these things, you are mostly wrong. A 2015 study, a randomized survey across eight countries, showed that the majority of physicians do not understand treatment effects. (2) Thus, we have the blind (physicians) leading the blind (patients). Be a patient advocate. Teach over the Internet. Learn how to use better tools. It's much better if you learn the numbers yourself, because then you can have genuine shared-decision making and informed consent. When I was Chief Resident in Emergency Medicine, at the end of Journal Club, I would ask the attending physicians, “What would you do?” They would often say, “Well the Jones study said that” but “the Smith study said that.” In other words, they would equivocate, because medical information is in a large disorganized cloud of over 25 million studies. There is not enough organization; there is not enough clarity. Once, when I was at Morning Rounds in surgery. Two attending surgeons started screaming at each other over how to treat a patient. Surgeon 1 screamed, "The Anderson study said X percent!" Surgeon 2 screamed, "The Jones study said Y percent!" I remember thinking if only we could only visualize their logic we would know which physician was more correct. We have created the solution for all four problems; we produce Treatment Scores. Remember, the Treatment Score = “the net treatment benefit for the patient.” Treatment Scores put patients first by summarizing medical studies from the patient's point of view. Patients have always needed Treatment Scores. Could the stakes be any higher? Patients' lives are at stake and their health is at risk. Your health is at risk. How to explain Treatment Scores? Most of us figure out our “gross income” and “net income” every year. Why can't we summarize the “gross treatment benefit” and the “net treatment benefit” for patients from the medical literature? It is simple with Treatment Scores' technology. Did you see the movie “Moneyball” about Sabermetrics starring Brad Pitt? Treatment Scores are “Sabermetrics for medicine.” Sabermetrics have revolutionized sports. Treatment Scores will revolutionize healthcare for the same reason, because like Sabermetrics, Treatment Scores reduce disorganized data down to one number. 1. Mark Twain and Benjamin Disraeli are both credited with the quote: There are three kinds of lies: lies, damned lies, and statistics. (2) Bradley C. Johnston, PhD, et al. "Do clinicians understand the size of treatment effects? A randomized survey across eight countries." Treatments Scores, Inc. and associated individuals do not claim to diagnose, cure, treat, or prevent any disease. 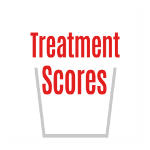 Treatment Scores are an educational system to help you figure out the science of medicine behind treatments, which should be the starting point for shared decision-making for all diagnoses. The information on this website should never be used as a substitute for the advice of a qualified, licensed physician or healthcare professional. We are not advocating any treatment, physician, medication, or any other entity. We are informational or educational only. We do not form physician-patient or doctor-patient relationships. Contact your physician for medical treatment. Call 911 if you may have an emergency or go to the Emergency Department. We are not responsible for any delays in care from information obtained from our site, nor for any consequential damages of any nature whatsoever, either directly or indirectly related to the use of this site, or from assumptions made. We cannot predict the future, we are only trying to do a better job of quantifying and reviewing what has happened in the past. We claim ZERO accuracy. We claim zero accuracy, because in medicine every patient is different, every statistic is a flawed statistic in some way, there are always estimations, and there is always bad or missing data. Averages may be used and no patient is average, every patient is unique. We make no promises or warranties whatsoever. SEE YOUR OWN PHYSICIAN FOR TREATMENT.